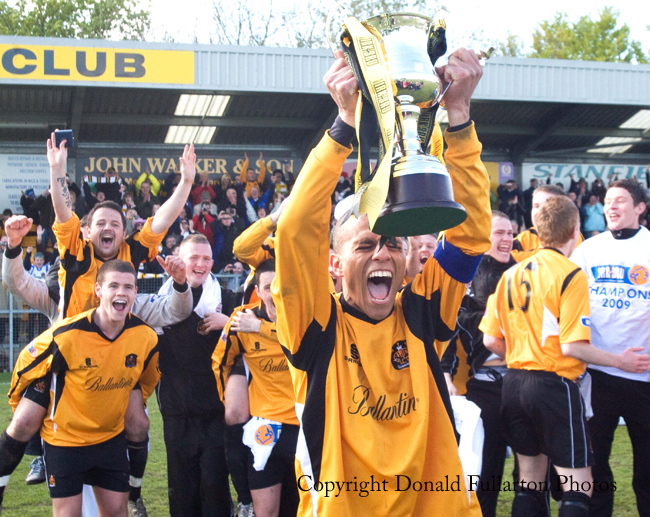 DUMBARTON ended their title-winning campaign in the Irn-Bru Scottish League third division in style at Galabank. Captain Gordon Lennon holds aloft the third division trophy. A crowd of 1,343 — half of whom had travelled from Dumbarton — saw the new champions comfortably beat league debut team Annan Athletic 3-1, then receive the trophy and medals in front of their adoring fans. Jim Chapman's men were determined to finish with an eighth successive win, and always looked the better side. Top scorer Ross Clark opened the scoring with his 15th of the season, finishing off from a close range a fine move involving Stevie Murray and Ross Forbes. At half-time and for the first five minutes of the second half a torrential downpour soaked fans and players, but during it on loan striker Denis McLaughlin rattled home the rebound of his own shot to make it 2-0. Sons new all-time defensive record was set at 747 minutes without conceding a goal when Peter Watson headed home for Annan to make it 2-1, but just before the end Derek Carcary netted his 14th of the season from an acute angle to cap a stylish victory. Then came the moment the fans had been waiting for when the players and the manager received their medals and skipper Gordon Lennon was presented with the trophy.